Our quad bike trailer for sale is designed to transport up to two quad bikes. The unit has a single axle unit with a carrying capacity of 750kg and can also be used as a flatbed trailer to transport large items like motorcycles, golf carts, bicycles, furniture etc. Quality workmanship is guaranteed as Trail Acc Trailer Manufacturers & Sales build these trailers which comply with both SABS specifications and the standards of the National Road Traffic Act. 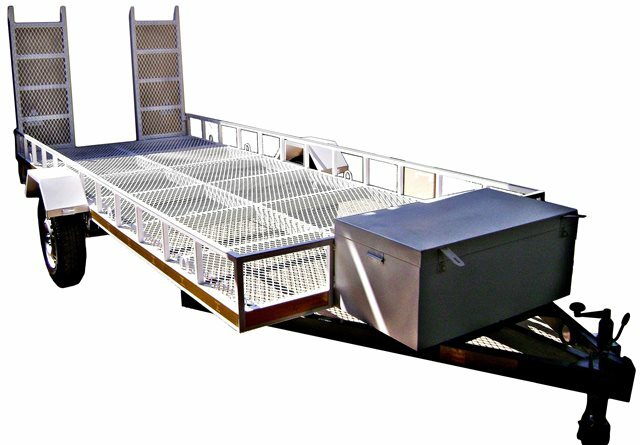 Drop-down ramps for easy loading and single axle without brakes. To purchase your own quad bike trailer, contact us today for best prices. Our well trained sales staff will assist you.